We pair gorgeous instructed artwork with a fun and inviting atmosphere. WANT THE LATEST UPDATES? SIGN UP FOR THE ART BAR NEWSLETTER! Select an event you/your group are interested in attending. Make reservations on the Facebook event page or by email on the contact page. 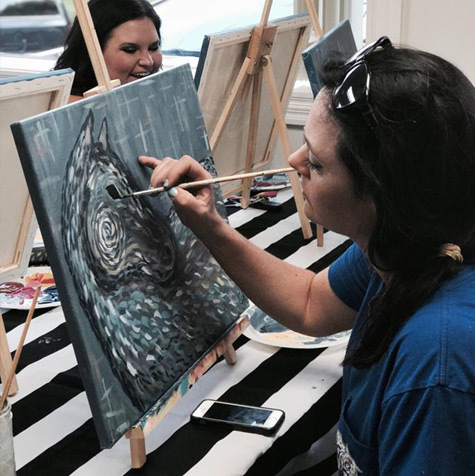 Show up on the event date and enjoy drinks and painting! Still have questions? Check out the Frequently Asked Questions! This makes for a wonderful and fun evening. Brook is an amazing instructor. It is so relaxing and brings out your creative side. Not only is it an enjoyable way to spend your evening, you get to bring home a beautiful piece of art. I highly recommend you give this a try — you will love it! I had a blast! I complained a lot about how my painting was awful and I just could not paint, but when I was done and I sat back and looked at what I had painted... I hung it in my living room! I want to see it everyday to remind myself that I did something pretty good! This was my wife and I's date night. We had a blast. The atmosphere is awesome and Brooklynn is very helpful and professional. It is fantastic to have something like this in eastern Kentucky. We will definitely be back! Simply exceptional. I had a wonderful time and managed to create awesome artwork in the process. They had a great wine selection along with some finger foods. Everything you need is already provided and you can take your painting home with you! This is without a doubt one of Salyersville's hidden gems — I was honored to be part of their inaugural gathering! You should definitely consider checking it out! I had a great time. I went alone, but once I got there, I fit right in and felt welcome! I would recommend the art bar to anyone.